The 2019 Endurance Parka is the new version of our British made flagship jacket. Hand-made in Manchester, it is warmer, lighter and stronger than any production jacket you can buy. The Endurance combines extreme cold survival performance to minus 30 with a range of highly desirable and practical upgrades. It weighs 962grams (around half the weight of competitor jackets) but can pack down to 2 litres, making it a must for city breaks and expeditions alike. The outer shell is constructed using an incredibly strong and waterproof Japanese technical fabric. Insulation pockets are hand-filled with 100% pure European goose down. This is a lifelong investment worthy of Shackleton’s motto, Fortitudine vincimus - By Endurance we conquer. Please scrutinise the full specification below. 100% waterproof lightweight Technical fabric - 20,000mm Hydrostatic head (twenty times more waterproof than the standard requirement). 100% Finest pure European Goose Down - 700 Fill power. Each individual pocket of down is hand filled & stitched. Removable Coyote fur hood trim. 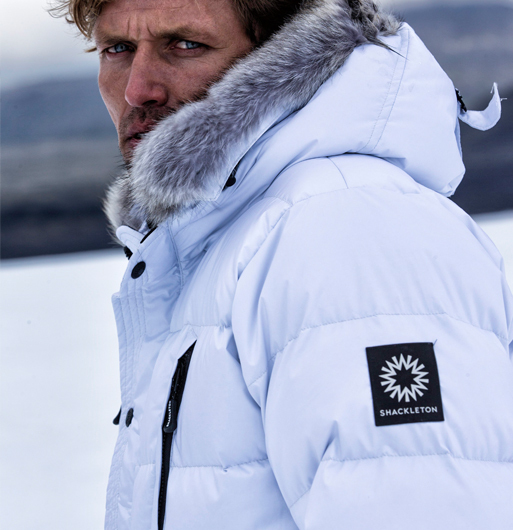 Unsurpassed warmth to weight ratio from world’s best quality pure goose down. Removable Coyote fur hood trim for cold weather protection to face and airways. Tested in Antarctica to minus 30 degrees centigrade. Iconic Shackleton Nine-pointed Star patch on left arm. Adjustable hood design - enables wearer to create wrap around tunnel to protect against extreme cold. Nine Pointed Star star featured on press studs and zip pullers. Large rubber zip pullers, designed with pimples on reverse for ease of use with cold hands or whilst wearing gloves. 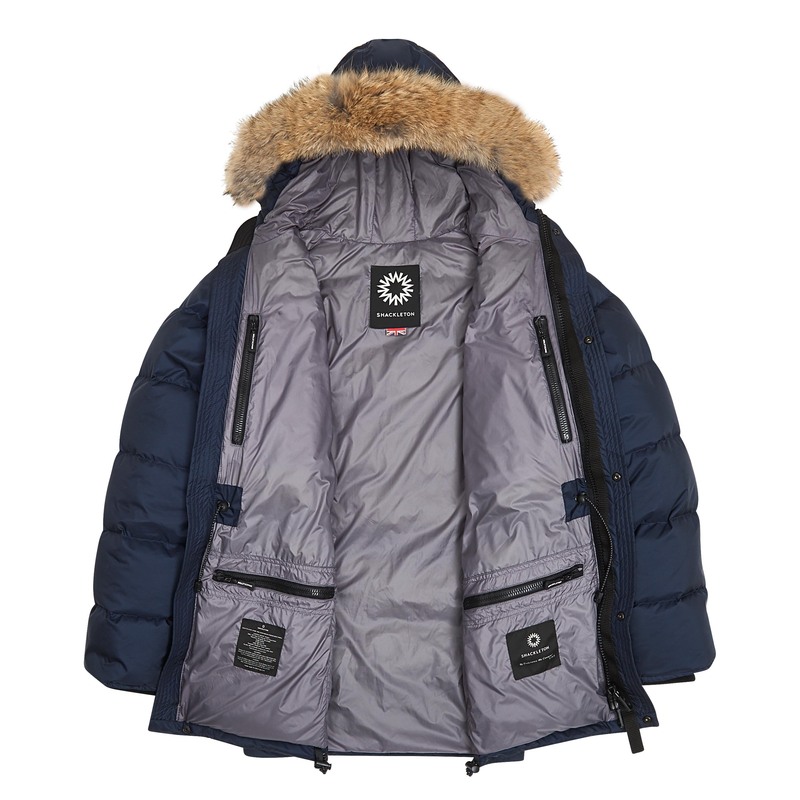 Four outer pockets - two chest (zipped) and two fleece lined hand warmer pockets with press stud fastening for quick access. Four large internal zipped pockets - two close to body core for extra warmth for storing phone & batteries in extreme cold environments. Waist draw cord for a tighter fit - minimising cold air flow, providing extra insulation. Lower draw cord for a tighter fit - extra protection in stormy conditions. Store away clean and dry. When storing use a wide hanger in a warm, dry place. 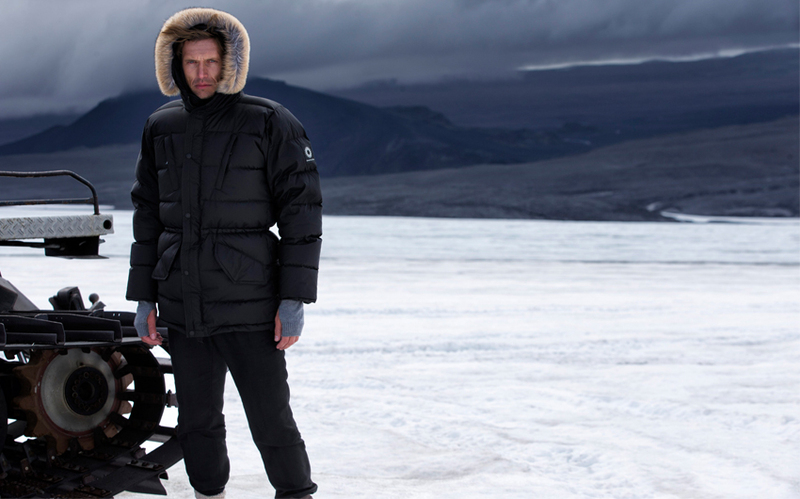 Avoid compressing your jacket for long periods. Only use the provided travel sac when travelling to and from your next adventure and when a more compact size is required. Small dirty marks on the shell fabric may respond to wiping with a damp cloth. If you decide to use a stain remover, use sparingly and make you sure give the item a good airing before use. To clean the whole item, down and all, washing is the only way to do it yourself. Clothing can be put through a washing machine or hand wash.
Use a mild natural soap product (not detergent) you may need to buy something designed for the job from an outdoor shop. The package will carry its own instructions, so you can follow them, or carry on as below. Set the washing machine for 'delicate' or 'wool' or the equivalent low temperature wash (usually 30 degrees). Use a side-loading machine. After it has gone through the spin cycle, most of the water will be out. But it will still need drying. Hang to air dry and give it a shake from time to time until you are satisfied that it is completely dry. Dry very thoroughly. Lighter, warmer, stronger and more waterproof than any production jacket you can buy. Performance tested in Antarctica to minus 30 degrees centigrade.